Attention: Raves and Good Work Committee! He kept all appointments and was always timely. His workers also did the work on the day they were told to come and always cleaned up after each day’s work at the job site. The quality of the work was impeccable. Recently, we had a problem with an elbow in the copper plumbing that was redone at the time of the earthquake. Once again, Roger Perron took care of the job in a timely and high-quality manner. We had a friendly betting pool with friends who were sure our job would take a year (bet #1) and that he would never finish it within the promised six months completion date (bet #2). We won both bets, and he not only finished early, he did so with spectacular results. More importantly, his design ideas and support during difficult times were stellar. 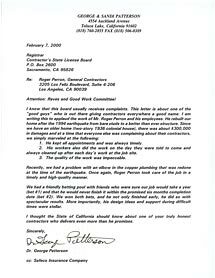 I thought the State of California should know about one of your truly honest contractors who delivers even more than he promises.